The day was unbearably hot in the prison camp where Lt. Smedley Hoskin-Smythe was interned. Men all around had collapsed in the heat, from both exhaustion and dehydration. And then there was the curse of scurvy to boot. Scarcely a man hadn’t lost his teeth, nor escaped the swollen joints, the severe pain of bruises and swellings all over their bodies. Smedley could hardly stand to look at them, he felt so disgusted, but since he was the only one with some skill as a dentist, he was forced to have to remove rotting loose teeth almost daily. There was one good side to all this, however, which was that he had amassed a small fortune in gold from the fillings. No one thought to ask him for their teeth back after an extraction. They were much too weak to even care. But Smedley cared. He had hidden the gold under the floor of his cabin, where for two years it had been slowly accumulating until now it was worth more than enough to buy his way out of this hell-hole. The day had come, and Smedley carefully packed the gold into his only sock that hadn’t a large hole in it, and approached the guard with whom he had established some sort of thief’s rapport. When he was sure no one was watching, Smedley handed over the sock. The guard gave him a nod and disappeared. The following morning when role call was done, it was discovered that Smedley was missing. Questions were asked and every shack was searched, but it was too late. Smedley was in the back of a truck heading for the border. But he had not entirely forgotten his mates, for the following day the prisoners were amazed when several large wooden barrels were delivered addressed to Colonel Hedley Fish-Brown, ranking officer of the prisoners. The Colonel inspected the barrels in a complete quandary as to the contents. Why would their captors do this? Or if not them, then from whom did it come? And what was inside in the first place? 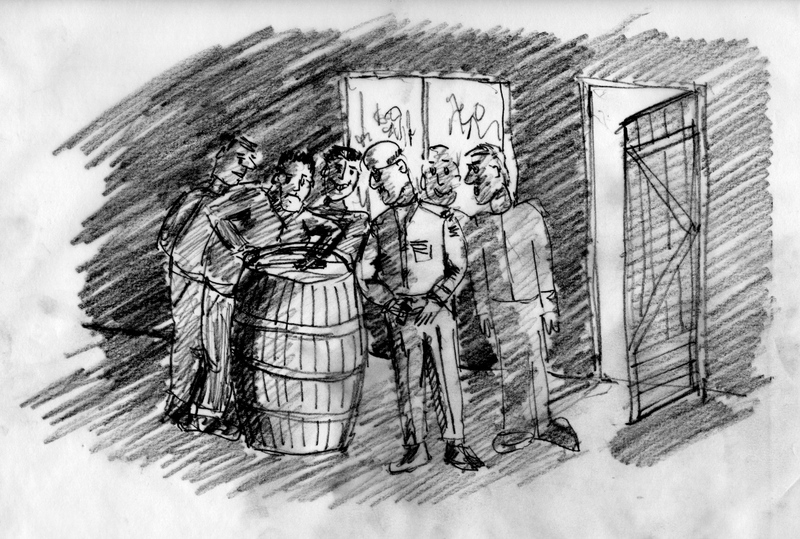 All these questions whirled through the minds of the men who set about to open the barrels. Hedley Fish-Brown lorded over the process, being sure to remain a little distance away just in case there was a trick. He feared the barrels might explode, or perhaps release some deadly gas when opened. He backed to the door, and prepared to run should things go wrong, as the men were about to release the first barrel’s lid. Off it came with a great sucking sound, and the air was filled with a smell that was at once sharp and yet mouth watering. Hedley knew that smell – he rushed over and pushed the men aside to have a good look. One man already had his mouth full of it as Hedley looked at the open barrel and then at the man. His eyes grew large and he felt his mouth begin to drool with saliva so that he could hardly stop from thrusting his hand in and grabbing some for himself. But he controlled this urge and instead ordered the lid be replaced. Then he turned to the assembled crowd outside and cleared his throat. “It’s the cure for scurvy,” said another. “I’ll eat it,” piped up another man. “Suit yourselves then,” said Fish-Brown and with a wave of his hand he commanded the assembled crowd to part as he left and returned to his hut. That evening after finishing dinner, the officers sat around discussing the events of the day, and specifically the barrels of sauerkraut. The colonel opened his mouth and Peabody- Parson peered in. There was a large gold filling, which the colonel pointed to. “That one,” he said. Suddenly it all became very clear to Captain Peabody-Parson. He went to Smedley’s bunk and opened the trunk that Smedley had used. There were the dentistry tools. The following day Peabody-Parson extracted the gold tooth from Colonel Fish-Brown’s jaw. Placing it in his best intact sock he hid it under the floor of his hut. Oddly, as soon as a certain guard heard that Peabody-Parson was the new dentist, the Captain was called aside and an agreement made.